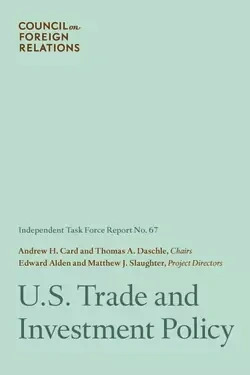 One of the most effective ways to create good new jobs and reverse the income decline of the past decade is for the United States to "become a thriving trading nation," concludes a new high-level Council on Foreign Relations (CFR)-sponsored Independent Task Force report on U.S. Trade and Investment Policy. The report calls for the Obama administration and Congress to "adopt a pro-America trade policy that brings to more Americans more of the benefits of global engagement, within the framework of a strengthened, rules-based trading system." The growth of global trade and investment has brought significant benefits to the United States and to the rest of the world. But U.S. leadership on international trade has waned in recent years because of deep domestic political divisions over trade policy that arise largely from the very real economic difficulties too many Americans face, acknowledges the Task Force. The Task Force warns that the political stalemate "has already harmed U.S. interests and will do more if it remains unresolved." "Unless the United States develops and sustains a trade policy that yields greater benefits for Americans in job and wage growth, it will be difficult to build the political consensus needed to move forward," says the report. The blue-ribbon group is chaired by former chief of staff during the George W. Bush administration and former secretary of transportation Andrew H. Card and former Senate majority leader Thomas A. Daschle, and is directed by CFR Bernard L. Schwartz Senior Fellow Edward Alden and Adjunct Senior Fellow for Business and Globalization Matthew J. Slaughter. The Task Force represents a consensus among what have historically been divergent views. Twenty-two high-level political, business, and labor leaders make up the Task Force, including former congressman Harold E. Ford Jr.; United Steel Workers leader Leo W. Gerard*; former secretary of agriculture and congressman Daniel R. Glickman; former Senate majority leader Trent Lott; former Caterpillar CEO James W. Owen; former Service Employees International Union leader Andrew L. Stern; former congressman William M. Thomas; and former chair of the Council of Economic Advisers Laura D'Andrea Tyson. The Task Force recommends that "the administration start by pushing harder for ratification of the three free trade agreements—with South Korea, Colombia, and Panama—still awaiting passage in the Congress." These delays have already caused the United States to lose its edge in the competition for trade with these countries. "The United States still has many economic strengths, and a new set of trade and investment policies built on those strengths will pay enormous dividends," says the report. Yet, even as the United States works to implement these measures "its competitors will not be standing still" the Task Force cautions. *Gerard participated as a member of the Task Force but did not endorse the general thrust of the final report. Edward Alden is the Bernard L. Schwartz senior fellow at the Council on Foreign Relations, specializing in U.S. economic competitiveness. The former Washington bureau chief for the Financial Times, his work focuses on immigration and visa policy, and on U.S. trade and inter­national economic policy. Alden was the project director for the Inde­pendent Task Force report U.S. Immigration Policy, which was chaired by former Florida governor Jeb Bush and former White House chief of staff Thomas F. McLarty III. Mr. Alden was previously the Canadian bureau chief for the Financial Times based in Toronto, and before that was a reporter at the Vancouver Sun specializing in labor and employ­ment issues. He also worked as the managing editor of the newsletter Inside U.S. Trade, widely recognized as the leading source of reporting on U.S. trade policies. Alden has a bachelor's degree in political science from the University of British Columbia. He holds a master's degree in international relations from the University of California, Berkeley, and pursued doctoral studies before returning to a journalism career. Nancy Birdsall is the Center for Global Development's founding pres­ident. She was executive vice president of the Inter-American Develop­ment Bank, the largest of the regional development banks, where she oversaw a $30 billion public and private loan portfolio. Before that she worked for fourteen years in research, policy, and management posi­tions at the World Bank, including as director of the Policy Research department. Prior to launching the center, she served for three years as senior associate and director of the Economic Reform Project at the Carnegie Endowment for International Peace, where her work focused on globalization, inequality, and the reform of the international finan­cial institutions. She is the author, coauthor, or editor of more than a dozen books and over one hundred articles in scholarly journals and monographs. Shorter pieces of her writing have appeared in dozens of U.S. and Latin American newspapers and periodicals. Birdsall received her MA from the Johns Hopkins School of Advanced International Studies and her PhD from Yale University. James J. Blanchard is co-chair of government affairs at the global law firm of DLA Piper LLP (U.S.). Previously, he served as U.S. ambassador to Canada from 1993 to 1996, after having served two terms as gover­nor of Michigan and four terms as a member of the U.S. Congress. In 1992, he chaired President Bill Clinton's successful campaign in Michi­gan. Blanchard is also former chairman of the Democratic Governors Association and the National Democratic Platform Committee, as well as a former member of the National Governors Association's executive committee. His eight years as Michigan's chief executive were notable for his success in turning around Michigan's finances, working with the private sector to attract business investment and trade from around the world. Prior to his election to Congress, he was assistant attorney gen­eral of Michigan. In 2010, he was named co-chair of the Canada-United States Law Institute, a forum where the two countries' governments, business communities, legal professionals, academics, nongovernmen­tal organizations, and media address issues confronting U.S.-Canada relations. Blanchard served on Senator Hillary Clinton's national finance committee. He serves on the board of directors of several corporations and, in February 2005, co-chaired the American Assembly project on U.S.-Canada relations, hosted and sponsored by Columbia University. Andrew H. Card is acting dean of the Bush School of Government and Public Service at Texas A&M University. He was appointed chief of staff in the presidential administration of former Texas governor George W. Bush. Card served as the eleventh U.S. secretary of transpor­tation under President George H.W. Bush. He also served in the George H.W. Bush administration as assistant to the president and deputy chief of staff. Card served under President Ronald Reagan as special assistant to the president for intergovernmental affairs and as deputy assistant to the president and director of intergovernmental affairs. He was president and CEO of the American Automobile Manufacturers Association (AAMA), the trade association. He served in the Massa­chusetts House of Representatives from 1975 to 1983. Currently, Card is also senior counselor at the global public relations firm Fleischman-Hillard, serving on the international advisory board. He serves on the board of directors at Union Pacific Corporation. He also serves on the U.S. Chamber of Commerce advisory board, an advisory board for Alexander Proudfoot, and some privately held corporate and nonprofit boards. Card graduated from the University of South Carolina with a Bachelor of Science degree. He attended the United States Merchant Marine Academy and the John F. Kennedy School of Government at Harvard University. Thomas A. Daschle graduated from South Dakota State University in 1969. Upon graduation, he entered the U.S. Air Force, where he served as an intelligence officer in the Strategic Air Command until mid-1972. Following completion of his military service, Daschle served on the staff of Senator James Abourezk. In 1978, he was elected to the U.S. House of Representatives, where he served for eight years. In 1986, he was elected to the U.S. Senate and eight years later became its Demo­cratic leader. Today, Daschle is a senior policy adviser to the law firm of DLA Piper. In 2007, he collaborated to create the Bipartisan Policy Center, an organization dedicated to finding common ground on some of the pressing public policy challenges. Daschle serves on the board of the Center for American Progress, acts as the vice chair of the National Democratic Institute, and is a member of the Council on Foreign Relations. He is a member of the Lyndon Baines Johnson Foundation board of trustees, the GE Healthymagination advisory board; the National Integrated Foodsystem advisory board; and the Committee on Collaborative Initiatives at the Massachusetts Institute of Technology. In addition, Daschle's board memberships include the Blum Foundation, the Energy Future Coalition, the Committee to Modernize Voter Registration, the U.S. Global Leadership Coali­tion advisory council, and the Advisory Committee on the Trust for National Mall. I. M. (Mac) Destler is the Saul I. Stern professor of civic engagement at the Maryland School of Public Policy. His scholarly work centers on the politics and processes of U.S. foreign policymaking. He is coauthor, with Ivo H. Daalder, of In the Shadow of the Oval Office, which analyzes the role of the president's national security adviser from the Kennedy through George W. Bush administrations. His American Trade Politics won the Gladys M. Kammerer Award from the American Political Sci­ence Association for the best book on U.S. national policy. Destler is also a fellow at the Peterson Institute for International Economics (IIE), where he conducts research on the political economy of trade policymaking. He has consulted on government organization for economic and foreign policymaking at the Executive Office of the President and the Depart­ment of State and has held senior research positions at IIE, the Carnegie Endowment for International Peace, and the Brookings Institution. He is the recipient of the University of Maryland's Distinguished International Service Award for 1998. Destler teaches trade policy, American foreign policymaking, and political institutions, and directs the Master of Public Policy program in international security and economic policy. Harold E. Ford Jr. is managing director and senior client relationship manager at Morgan Stanley. Previously, he was executive vice chairman of global banking and wealth management at Bank of America. Ford served ten years in the U.S. Congress. Elected at twenty-six, he served on the House Financial Services and Budget committees. Described by President Bill Clinton as "the walking, living embodiment of where America ought to go in the twenty-first century," Ford also chairs the Democratic Leadership Council and is a distinguished practitioner in residence at the Wagner School of Public Service at NYU. During Ford's five terms in Congress, he was an active member of the House Blue Dog coalition, where he worked passionately to balance the budget and promote free enterprise. Ford serves as an overseer for the Inter­national Rescue Committee, is a member of the Pentagon's Transfor­mation Advisory Group and the Council on Foreign Relations, and serves on the boards of directors of America's Promise and the Posse Foundation. Ford is a graduate of the University of Pennsylvania and the University of Michigan Law School. Leo W. Gerard* serves as the international president of the United Steelworkers (USW), a position he was elected to in 2001. As president of the USW, Gerard was instrumental in the formation of the Indus­trial Union Council of the American Federation of Labor and Congress of Industrial Organizations (AFL-CIO) and in February 2003 was appointed to serve on the AFL-CIO's executive committee and execu­tive council. He is also a board member of the AFL-CIO Transportation Trades department and chairs the AFL-CIO public policy committee. Prior to becoming president of the USW, Gerard served as the union's international secretary-treasurer, as national director of Canada, and as director of District 6 in Ontario. He was also appointed a USW staff representative. In addition, Gerard serves on the U.S. National Com­mission on Energy Policy, is a founding board member of the Apollo Alliance, and is co-chairman of the board of the Blue Green Alliance. Daniel R. Glickman is currently the executive director of the Aspen Institute Congressional Program and a senior fellow at the Bipartisan Policy Center in Washington, DC. Glickman served as chairman of the Motion Picture Association of America, Inc. (MPAA), from 2004 until 2010. Glickman served as the U.S. secretary of agriculture from March 1995 until January 2001 and served for eighteen years in the U.S. House of Representatives representing the 4th Congressional District of Kansas. Glickman serves as vice chair of the board of World Food Program USA and is a board member of Communities in Schools, the Chicago Mercantile Exchange, Oxfam America, Food Research and Action Center, National 4-H Council, and the Center for U.S. Global Engagement, where he is chair of the U.S. Global Leadership Coalition. Glickman co-chairs an initiative called AGree, which looks at long-term domestic and international implications of food and agricultural policy. He also chairs an initiative at the Institute of Medicine on accelerating progress on childhood obesity. He is a member of the Council on For­eign Relations and serves as co-chair of the Chicago Council on Global Affairs global agriculture development initiative, and he coauthored "Farm Futures" in Foreign Affairs (May/June 2009). Robert E. Litan is the vice president for research and policy at the Kauffman Foundation in Kansas City and a senior fellow in economic studies at the Brookings Institution. He has served in several govern­ment positions, including as associate director of the Office of Manage­ment and Budget, deputy assistant attorney general of the Department of Justice's antitrust division, and staff economist at the Council of Eco­nomic Advisers. He has also consulted for numerous public and private sector organizations, including the Department of the Treasury and the World Bank. During his career, Litan has authored or coauthored more than twenty-five books, edited another fourteen, and authored or coauthored more than two hundred articles in journals, magazines, and newspapers on government policies affecting financial institutions, regulatory and legal issues, international trade, and the economy in gen­eral. His most recent book is Good Capitalism, Bad Capitalism, and the Economics of Growth and Prosperity. Trent Lott serves as senior counsel at Patton Boggs LLP. Previously, he represented the people of Mississippi in Congress for thirty-five years and is one of a handful of officials to have held elected leadership positions in both the House of Representatives and Senate. During his sixteen years in the House and nineteen years in the Senate, he worked closely with seven presidential administrations and was regarded as a savvy coalition builder and dealmaker. Lott joined the House in 1973, representing Mississippi's Fifth Congressional District. From 1981 to 1989, he served as House minority whip, forging the bipartisan alliance that enacted Ronald Reagan's economic recovery program and national security initiatives. He also founded the House's first modern whip organization with a focus on regular member-to-member contacts and extensive outreach to sympathetic Democrats to secure passage of major legislation. In 1988, Lott was elected to the Senate. In 2006, he was elected Senate Republican whip, giving him the distinction of being the only person to hold that position in both the House and Senate. Before joining Patton Boggs, Lott and fellow former senator John Breaux founded the Breaux-Lott Leadership Group. Kevin G. Nealer is a principal and partner in the Scowcroft Group, an international business advisory firm. In this capacity, Nealer provides risk analysis and direct investment support to the group's multina­tional clients. Nealer has lead responsibility for the firm's support for the investment community, providing analysis to leading currency and equity/debt traders. In addition, he assists industrial and financial clients in project planning and implementing investment and workout strate­gies. Previously, Nealer served on the professional staff of the Senate Democratic Policy Committee, where he worked on trade and interna­tional economic policy and was a Foreign Service officer with the State Department. Nealer has served as a lecturer, program moderator, and adjunct professor of trade law and policy at the Georgetown Univer­sity McDonough School of Business and was a Fulbright professor in China. Nealer received his undergraduate degree from the University of Michigan and his law degree from Case Western Reserve University School of Law. Following his confirmation by the U.S. Senate, Nealer was sworn in as a member of the board of directors of the Overseas Pri­vate Investment Corporation, the development finance agency of the U.S. government, where he serves on the audit committee. James W. Owens served as chairman and CEO of Caterpillar Inc. in Peoria, Illinois, from 2004 through June 2010. Owens was named chair­man and CEO of Caterpillar in 2004 after spending his entire career at the company. In his first five years, 2004 to 2008, Caterpillar's revenue grew from $22.8 billion to $51.3 billion, setting sales and profit records every year. Owens is currently a director of Alcoa Inc. in Pittsburgh, Pennsylvania; IBM Corporation in Armonk, New York; and Morgan Stanley in New York City. He also serves as a senior adviser to Kohlberg Kravis Roberts & Co. in New York. Owens is chairman of the Execu­tive Committee for the Peterson Institute for International Econom­ics in Washington, DC, and a member of the Board of Directors of the Council on Foreign Relations in New York. He serves on the executive committee of the Business Council and was a member of President Obama's Economic Recovery Advisory Board from 2009 to 2010. He is also a member of the board of trustees for North Carolina State Uni­versity in Raleigh, North Carolina. Owens is a native of Elizabeth City, North Carolina, and graduated from North Carolina State University in 1973 with a PhD in economics. William F. Owens is a senior fellow of the University of Denver's Institute for Public Policy Studies and a special guest instructor in the undergraduate and graduate programs. Owens, who served two terms as governor of Colorado, was called "the best governor in America" by National Review magazine and has been praised by the Cato Institute and the Wall Street Journal for his pro-growth economic policies. Owens presently serves on the boards of four New York Stock Exchange firms, advises two private equity firms, and is on the board of Russia's second-largest railroad. Prior to his service as governor, Owens served as state treasurer and was elected to both the Colorado House and Senate. He has been a regular speaker and panelist at the World Economic Forum in Davos, Switzerland, and a guest lecturer at Moscow State University; the University of Kazan; New Russian University (Moscow); British/American University in Alma Aty, Kazakhstan; and the University of Dublin. Owens earned a Master of Public Affairs degree from the Lyndon B. Johnson School of Public Affairs at the University of Texas at Austin. Pamela S. Passman is corporate vice president and deputy general counsel for Microsoft and has led its Global Corporate and Regula­tory Affairs function since 2002. Her responsibilities have included providing regulatory counsel to business groups and developing cor­porate positions on public policy issues, such as intellectual property rights, privacy, Internet security, international trade, and telecommu­nications; strengthening government and industry relations; devel­oping partnerships with governments, international organizations, nonprofits and industry; and overseeing Microsoft's philanthropic investments. From 1996 to 2002, Passman served in Tokyo as associ­ate general counsel, responsible for Microsoft's Law and Corporate Affairs groups in Japan, South Korea, Taiwan, and the People's Repub­lic of China, including Hong Kong. Prior to joining Microsoft, Passman was with Covington & Burling in Washington, DC. She also practiced in Japan with Nagashima & Ohno and served as special counsel to the Office of Political and Economic Research, Itochu Corporation. Passman is chair of the Board of Information Technology Industry Coun­cil and serves on the boards of Business for Social Responsibility, the National Bureau of Asian Research, and Kids in Need of Defense. She is a graduate of Lafayette College and the University of Virginia School of Law. She was also a recipient of a Watson Foundation grant for research in Japan. Matthew J. Slaughter is associate dean and Signal Companies' professor of management at the Tuck School of Business at Dartmouth College. He is also currently an adjunct senior fellow at the Council on Foreign Rela­tions; a research associate at the National Bureau of Economic Research; a member of the academic advisory board of the International Tax Policy Forum; an academic adviser to both the Deloitte Center on Cross- Border Investment and the Organization for International Investment; and a member of the U.S. State Department's Advisory Committee on International Economic Policy. Slaughter served as a member on the Council of Economic Advisers in the Executive Office of the President. In this Senate-confirmed position, he held the international portfolio, advising the president, the cabinet, and others on issues including inter­national trade and investment, energy, and the competitiveness of the U.S. economy. He has also been affiliated with the Federal Reserve Board, the International Monetary Fund, the World Bank, the National Academy of Sciences, the McKinsey Global Institute, the Institute for International Economics, and the Department of Labor. Slaughter received his bachelor's degree from the University of Notre Dame and his doctorate from the Massachusetts Institute of Technology. Andrew L. Stern is the former president of the 2.2 million member Service Employees International Union (SEIU), the largest union of health-care, hospital, nursing home, home-care, janitorial, security, child-care, food service, and state workers, and the fastest-growing union in North America. SEIU was widely credited for creating the most effective grassroots political organization and raising the coun­try's largest political action fund that helped elect President Barack Obama. Called a "courageous, visionary leader who charted a bold new course for American unionism," the union was recognized as the most engaged and influential advocate of health-care reform, helping secure the historic passage of the 2010 Health Care Reform Act. Stern contin­ues that work as a fellow at the Georgetown University Public Policy Institute and as director of AmericaWorks, a project of the Tides Foun­dation. He was named in 2010 as a presidential appointee to the National Commission on Fiscal Responsibility and Reform. Stern began work­ing as a social service worker and member of SEIU Local 668 in 1973. He served as organizing director for SEIU before his landmark election as its youngest president in 1996. Stern is a graduate of the University of Pennsylvania. William M. Thomas was a member of the U.S. House of Represen­tatives for twenty-eight years and has spent his career strengthening health-care legislation, reducing tax burdens, advocating free and open trade, and protecting workers' pensions. Thomas continues his exami­nation of substantial economic issues in search of coalition-building solutions through his work as a visiting fellow at the American Enter­prise Institute. During his six years as chairman of the House Ways and Means Committee, Thomas helped the president attain Trade Promo­tion Authority (TPA) and guided seven free trade agreements through Congress. After nearly a decade with few comprehensive free trade agreements, Thomas led the charge in Congress to reauthorize TPA and empower the president with the necessary negotiating ability to open new markets to U.S. exports and create more American jobs. Thomas also was responsible for reforming Medicare legislation, nearly $2 tril­lion in tax relief, and reforms to the U.S. pension system. He also led efforts to reduce the tax burden on small businesses, manufacturers, and other job creators through a new tax deduction for domestic manu­facturing activities; enhanced Section 179 expensing for small busi­nesses; and introduced international tax reforms to make U.S.-based companies that operate abroad more competitive. Laura D'Andrea Tyson is the S. K. and Angela Chan professor of global management at the University of California, Berkeley, Haas School of Business. She was previously dean of the London Business School and the Haas School of Business. Tyson is also a member of President Obama's Council on Jobs and Competitiveness. She served in the Clin­ton administration and was the chair of the Council of Economic Advis­ers and the National Economic Council. Tyson is a senior adviser at the McKinsey Global Institute, Credit Suisse Research Institute, and the Rock Creek Group; a senior fellow at the Center for American Progress; and a member of the MIT Corporation and National Academies Board on Science, Technology, and Economic Policy. Tyson is on the advisory coun­cil of the Brookings Institution Hamilton Project and is an advisory board member of Newman's Own, Generation Investment Management, and H&Q Asia Pacific. She is also a special adviser to the Berkeley Research Group and a member of the Committee on Capital Markets Regulation and the National Academies Committee on Research Universities. Tyson serves on the boards of directors of Eastman Kodak Company, Morgan Stanley, AT&T, Silver Spring Networks, CB Richard Ellis, the Peter G. Peterson Institute of International Economics, New America Founda­tion, and the Committee for a Responsible Federal Budget. John K. Veroneau is a partner at Covington and Burling LLP and co­chair of the international trade and finance practice group. Veroneau served as deputy U.S. trade representative (USTR). He previously served as the USTR's general counsel, responsible for U.S. trade law and litigation activities. In these capacities, he worked on a wide range of matters, including negotiating trade and investment agreements, ini­tiating and defending World Trade Organization disputes, executing U.S. trade laws (such as Section 421 China safeguards and Section 337 infringement cases), and assisting U.S. companies to overcome foreign regulatory barriers. As deputy USTR, Veroneau made official visits to more than thirty countries and represented the USTR on various gov­ernment boards, including the Committee on Foreign Investment in the United States, Export-Import Bank, Overseas Private Investment Cor­poration, and Millennium Challenge Corporation. He was also con­firmed by the U.S. Senate to serve as an assistant secretary of defense in President Bill Clinton's administration. He has extensive legislative branch experience, having served as legislative director to Senator Bill Cohen (R-ME) and Majority Leader Bill Frist (R-TN) and as chief of staff to Senator Susan Collins (R-ME). Carmencita N. Whonder is a policy director in the Washington, DC, office of Brownstein Hyatt Farber Schreck, LLP, where she is a member of the government relations department. She provides strategic public policy advice to clients primarily in the financial services and housing sectors before the U.S. Congress and executive branch agencies. Prior to joining Brownstein, Whonder served as the staff director for the Senate Subcommittee on Housing, Transportation, and Community Development and as the principal adviser on the Senate Banking, Hous­ing, and Urban Affairs Committee to U.S. Senator Charles E. Schumer (D-NY). During the 109th Congress she held the position of minority staff director for the Senate Subcommittee on Economic Policy. For four years, Whonder was responsible for issues including banking, financial institutions, securities and commodities markets, economic and monetary policy, the Committee on Foreign Investment in the United States, insurance, consumer protection, housing and commu­nity development, and trade. She previously worked as a leadership education counselor for Gates Millennium Scholars Program/UNCF. In 2000, Whonder worked in Geneva, Switzerland, at the World Intel­lectual Property Organization, a United Nations specialized agency, focusing on e-commerce and trade issues. Whonder holds a bachelor's degree from Howard University and a master's degree from the Johns Hopkins University School of Advanced International Studies. Alan Wm. Wolff co-chairs the International Trade Practice of Dewey & LeBoeuf. He is chairman of the National Foreign Trade Council, the comparative innovation committee of the Science, Technology, and Economic Policy Board of the National Academies, and of the board of the Institute for Trade and Commercial Diplomacy, and is a member of the advisory committee of the Peterson Institute for International Eco­nomics and of the board of the U.S.-China Legal Cooperation Fund. From 2010 to June 2011, he was distinguished research professor at the Monterey Institute of International Studies, a graduate school of Mid­dlebury College. Wolff served as deputy special representative for trade negotiations in the Carter administration and was general counsel of that office in the Ford administration, after holding senior positions in the Treasury Department. He has served on a number of government advisory committees, including the President's Advisory Committee on Negotiations under Carter, the Services Policy Advisory Commit­tee under Reagan, and the State Department's Advisory Committee on International Economic Policy under Bush and Obama. Wolff has written extensively and testified on trade policy issues. He is a national associate of the National Academies and is a member of the bar in New York, Massachusetts, and the District of Columbia. He is a graduate of Columbia Law School and Harvard College.